If you are planning to give Christmas a retro theme, here are a few suggestions from the 50s, 60s and 70s. Christmas can be a great time to give your home a retro look. Retro Christmas decorations are cheap to buy and can look great. There are also new decorations available with a retro theme. You could also give your Christmas lunch a retro twist. We look at the traditional Xmas meal, as well as Christmas TV and toys and games from the past. The traditional real Christmas tree was popular in the 50s, 60s, 70s and 80s. 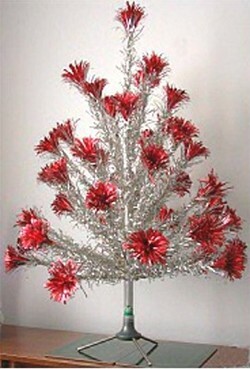 Although artificial tinsel Christmas trees were gaining in popularity; you did not have to hoover up the pine needles. This artificial Christmas tree (right) is from around 1965. They also have some retro style Christmas lights on the tree. Retro, to us that is, in the 60s they thought these were really modern. This tree, in a fairly well off middle class home, is decorated in a restrained manner with only a few shiny balls in addition to the Christmas lights. Perhaps it says something about the minimalist modernity of the 60s. 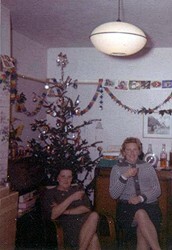 These two ladies (left) are enjoying a Christmas drink in front of a real Christmas tree in 1962. This looks like a more working class home than the previous photograph. Here the heavily decorated real tree, and hand made paper chain decorations holds sway. These people are also proudly displaying a selection of Christmas cards from friends and relatives. Baubles or shiny balls were favourite Christmas decorations in the 50s, 60s, 70s and 80s. Baubles from the 50s and 60s reflected some of the modern style of the era. There were two popular types: the icicle and the ball with a crushed in or indented look. These two baubles on the far right are of the icicle design. Their elongated cigar type shape gave a modern look to the traditional Christmas shiny ball. The retro baubles on the left show the crushed in look. I wonder if it was meant to represent a lamp? The seventies brought unbreakable plastic shiny balls. Where do I buy retro baubles? Whilst you can get modern versions of retro style Christmas baubles, there is nothing better than the real thing. They do turn up from time to time in charity shops, but decorations from the 50s or 60s are harder to come by these days. There is always a good selection of retro baubles on eBay. �10 will get you a box of small decorations, but you will need to pay �20 to �30 for a good quality box of large baubles from the 60s. This Angel Pine Christmas Tree (left) dates from the 1960s. It is made from aluminium foil. The red decoration is part of the tree. It was a variation on an earlier design. I imagine it was an attempt to "jazz up" the previous look. The instructions for the tree without the red decoration recommended a few, large shiny balls as decoration. Once again, the minimalist, good taste look. Beware, if you do have one of Angel Pine Trees, they cannot be decorated with electric Christmas lights. 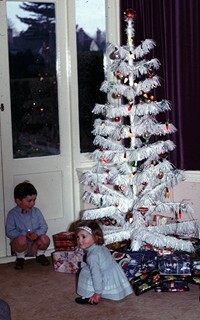 This delightful picture, right, shows two children decorating a small Christmas tree in 1965. It was common to have a smaller tree in the hall or on the landing, as shown here. Once again restrained decoration is preferred. 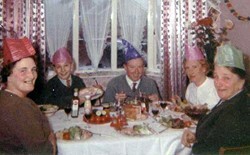 Christmas lunch from the mid fifties onwards, once rationing had been forgotten, was a very traditional affair. The menu would be recognisable by most people today as the traditional Christmas celebration. Christmas was, as is now, very much a family event, with everyone sitting down to the traditional Christmas lunch. Many people served turkey as the main meal throughout the 50s, 60s and 70s. The evergreen TV Chef, Marguerite Pattern suggested turkey and gammon for the main course. A Christmas pudding usually followed, topped with custard. For alternative puddings Marguerite Patten suggested Charlotte Russe, a dessert made from double cream, jelly, oranges and apricots, surrounded by sponge fingers, (sponge fingers were popular in the 60s and 70s), or raspberry meringue nests. Mince pies were also favourites, as were mincemeat based puddings, such as a mincemeat flan topped with meringue. This picture, right, is from the late fifties. People often wore their best clothes for Christmas. The young girl in this picture is wearing a red dress with faux leopard skin trim. Leopard skin was very popular in the late 50s. 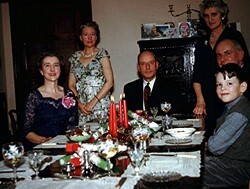 Both tables are decorated with a centre piece of red candles and Christmas foliage. This was a traditional Christmas table decoration in the 50s and 60s. This group are enjoying a choice of wine or orange juice. Wine was a middle class drink in this era. Many people would have had beer on the table at Christmas. Mild or brown ale was popular in the late fifties and early sixties. By the seventies, more people would be drinking wine: namely Blue Nun or Black Tower. By the 80s, dry wines were in, Chardonnay in particular. After the Christmas lunch, many people settled down to watch the Queen's Christmas speech to the nation. The Queen first broadcast a Christmas message on television in 1957. Another television tradition that started in the 70s was the Morecambe and Wise Christmas show. The two comedians claimed Christmas would not be the same without them. Other favourite Christmas shows from the 70s included the Two Ronnies and Mike Yarwood. Families also ate a traditional Christmas tea, as well as lunch. It was often a salad, with cold turkey left over from lunch, which, no doubt would do for Boxing Day (and beyond!) as well. This family (right) is enjoying a salad. Party hats from crackers add to the festive flavour. There are bottles of HP sauce and Heinz Salad Cream on the table. There is a good sized pork pie and some tomatoes and cucumber. The drink is probably port. Port was the most popular wine before the War and was still enjoyed in many homes at Christmas. However, sherry was gaining in popularity and had ousted port as Britain's favourite wine long before 1962. No Christmas tea would be complete without the traditional Christmas cake - usually a rich fruit cake, decorated with (usually rock hard!) royal icing, made to look like snow and with a plastic snowman and Santa as the finishing touches. 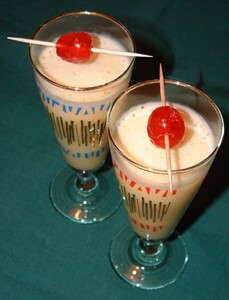 Go retro this Christmas with this classic cocktail, the Snowball, which was popular in the 60s and 70s. Just mix advocaat, lemonade and a dash of lime cordial, whisk and serve in a tall glass with a cherry on a cocktail stick. For a stronger drink try a shot of vodka for a Russian Snowball. eBay is a great place to shop for retro Christmas decorations. They are usually very cheap compared with the modern ones and look much more distinctive. Mix and match modern with original decorations from the 50s and 60s, or go completely retro. My memories of a quintessential 70s Christmas were... waking up early, very excited indeed, wondering what Santa had delivered. One year (1973) I had a Dr Who toy Dalek. Another year (1977) a Raleigh Budgie mini Chopper bike. By mid morning there would be the unmistakable aroma of roast turkey drifting throughout the house. 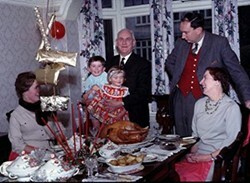 Apart from Christmas '78 we always had turkey, that year we had goose - very nice too. The roast was served with stuffing, Brussels sprouts, roast potatoes, parsnips, carrots and pigs in blankets. We had the rare treat of white wine with the meal - I was allowed a little! My father would always light the pud with rum, while wearing a typical 70s cardigan. To finish off we all had an after eight mint, and the adults also had a Benedictine liquor amongst themselves, or maybe a Harvey's Bristol cream. Then came the Queen's speech. After that we watched the feature film which would take us up to the evening snack of cold turkey and pickle sandwiches followed by the obligatory Yule log and mince pies. We would round the evening off by maybe watching another film or the Christmas Morecambe and Wise show - I would be starting my bar of Toblerone by then.